Take a trip to China to capture the Crazy Dragon. Click here to play! Make your way through pagodas and bonsai gardens to find all three sections of the dragon and win many golden pieces. While you're enjoying the serenity of beautiful Chinese gardens, you can collect a line of three beautiful coy fish to win up to 3000 coins. Three fire crackers will pay out up to 300 coins. Three bonsai trees pays out up to 30 coins and three pagodas will get you up to six coins. Since you're in search of the crazy dragon, you're really spinning for sections of the mystical dragon of wealth. The head will win you two free spins. The head and body will win five free spins. The head, body and tail will win 20 free spins. And to achieve ultimate balance in the world of the Crazy Dragon, the Yin Yang symbol helps to create more winning combinations through substitutions. Go on a quest through China to find the Crazy Dragon and you will be rewarded with innumerable riches. The Yin and Yang Symbol substitues for all other symbols except the dragon symbols. 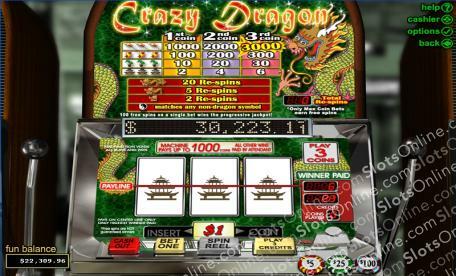 Collect sections of the Crazy Dragon to trigger an on the reels bonus, which rewards the player with free games.